Section 498A of the Indian Penal Code creates a real and distinct danger for any non-resident Indian husband who may need to secure the assistance of the Indian authorities in any child custody case. The law provides for the punishment of the husband and his relatives if a married woman is subjected to cruelty which is likely to drive a woman to commit suicide or cause grave physical or mental injury to her, and harassment with a view to coercing her or any of her relatives to meet any unlawful demands of property. Unfortunately, it has unwittingly created an easy way – that is very frequently used -- for a disgruntled Indian wife to use the legal system to keep her husband out of India and to subject him to blackmail and abuse in family law cases. I have testified on these matters on several occasions. Now the Indian Law Commission is recommending some changes to the law, in order to reduce the prevalence of what the Supreme Court of India has described as "legal terrorism." The government’s expert panel on legal issues has recommended a change in the criminal law to prevent the immediate arrest of husbands and their family members against whom police complaints are filed by their wives under the anti-dowry law. The Law Commission of India, in its latest report, has asked the government to water the anti-dowry law down to allow a woman to withdraw her complaint if a compromise with her husband and his family is possible. The panel also wants to make it a compoundable offence but with a court’s permission. The Supreme court had asked the law commission to give its findings on whether section 498A of the IPC and enabling laws, which deal with physical and mental cruelty by husbands and their relatives against wives over dowry, require amendments following reports of their misuse. 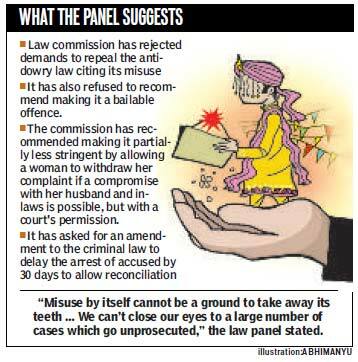 It has sought an amendment to the Code of Criminal Procedure (CrPC) in a bid to introduce a 30-day “reconciliation” period before police can arrest an accused under the anti-dowry law. “The need for caution in exercising the drastic power of arrest in the context of cases under section 498A the IPC has been emphasised by courts and parliamentary committees time and again,” states the report. “We, therefore, suggest that a new clause may be added to the CrPC section 41 to make clear that whenever a complaint of physical and mental cruelty is filed by a married woman, a police officer shall set in motion a process of reconciliation between the two parties before he or she resorts to the power of arrest,” the commission recommended. This 30-day period, however, will not apply if an investigating officer feels that “facts disclose an aggravated form of cruelty” and the arrest of an accused is necessary, it points out. It has rejected the demands for either recommending a complete repeal of the anti-dowry law or making it a bailable offence. “Misuse by itself cannot be a ground to take away its teeth … We can’t close our eyes to a large number of cases which go unprosecuted,” the commission stated.